. : about us page for Inspiraweb ltd Web design consultants :. Creating Innovative Web Design and Internet solutions. SiteWrite© our state of the art content management so ftware which enables our clients to manage the content of their website themselves without having to acquire web design skills - all that you require is basic PC skills and a computer with Internet access. 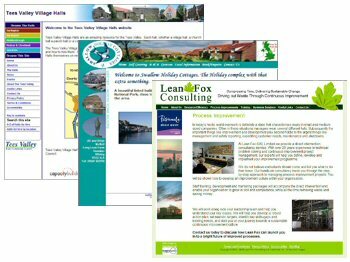 As well as small and medium enterprise (SME) organisations we have been working with charity groups, voluntary community sector (VCS) and social enterprise partnership (SEP) organisations and the ethos behind everything that we do is to provide our customers with a user friendly system, which allows them to administer the content of their website. To enable us to satisfy clients' requirements, we developed our flagship product Inspiraweb SiteWrite© which is much more than a standard Content Management System (CMS). SiteWrite has the advantage of being a powerful yet user friendly system that has been designed from the ground up, with the intention of delivering websites that are DDA compliant, Search Engine Optimised and managed by the client 24/7/365. From little acorns oak trees grow and SiteWrite© has some siblings to cater for customers with a requirement for a more demanding web presence (SiteWrite Pro© and SiteWrite Portal Directory©). To find out more about these and other products in the Inspiraweb family please visit our Solutions pages. Our comprehensive services include the following: For more detailed information please visit our What we do page. Inspiraweb is able to assist you in taking the jargon out of Information and Communication Technology (ICT), and before even beginning the process of developing your website, we will assess your needs, and work with you to define your goals and target audience. Architectural design, taking account of requirements for security, dependability, usability, performance, scalability etc.